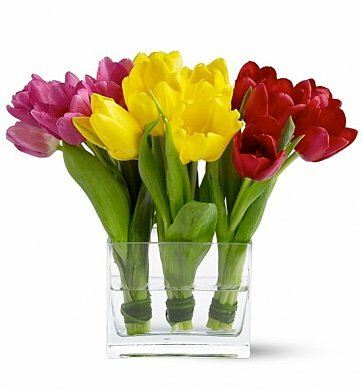 Three bouquets of sweet tulips are presented in a rectangular vase for a modern and stylish display. The tulips are separated by color and tied with lily grass at their base, making them a beautiful and colorful reminder of best wishes. Red, Pink and Yellow Tulips. Fresh Tulip Trio is a hand delivered gift. These gifts are delivered by one of our local design centers located throughout the United States and Canada. Same day delivery is available for most gifts when ordered before the cutoff time. The cutoff time for Fresh Tulip Trio is 2 PM in the recipient's time zone. Flowers looked great, same day delivery which was a life saver. Will be ordering again. This gift was delivered punctually and was exactly as promised. Very satisfied. Tulips arrived day of purchase. A representative even called me before hand to make sure the color worked. Very pleased with overall service. My aunts sent me a picture and these arrived even more beautiful than in the picture shown. Absolutely gorgeous, I will definitely order again! Thank you so much! My Mom loved her flowers! Awesome! My Mom loved the flowers I sent her for Mother's Day. I will definitely be using your company again! Arrived on time and the tulips were fresh and beautiful! Talked with my sister and a week later flowers were just about done but still nice! I ordered from out of state and my sister said they were just beautiful-- very simple and classy.